On the 4th November, 1942 a Lockheed Hudson bomber crashed in bad weather at West Dapto while patrolling for enemy submarines. 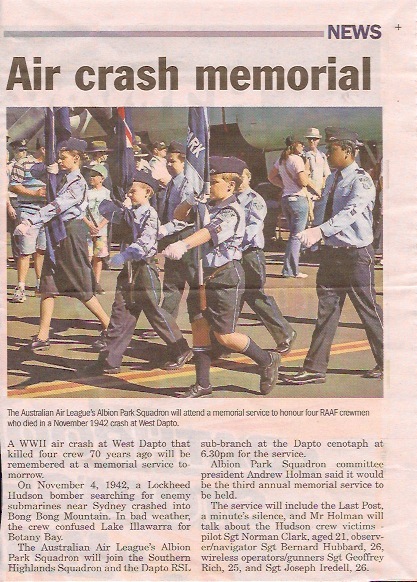 Last Thursday cadets from the Australian Air League Albion Park and Southern Highlands took part in a service at Dapto RSL to honour their sacrifice. Follow the service the Dapto RSL arranged for a copy of the service, the WinTV footage and letters from the cadets to go over to the troops in Afghanistan in an RAAF C-130. 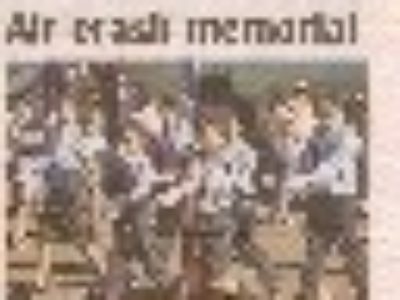 The service was held on Thursday night, with some cadets also attending the Win TV news coverage during the day. Thanks to those cadets able to attend on such short notice, it goes a long way to presenting their squadron and the Air League. Thanks also go to Mr Holman for arranging the event, also a big thank you to Federal Education Officer Mr Andrew Dennis participating in the event.